Siam Square (Thai: สยามสแควร์) is Bangkok's main shopping drag and its BTS Skytrain station is often considered as the centre of the city. This article expands the area to include Ratchaprasong, Phloen Chit Road, Hualamphong Train Station and Chulalongkorn University. While Rattanakosin represents Thailand's history and culture, Siam Square represents Thailand as a newly industrializing economy. Siam Square's first buildings were only constructed in the 1970s, on land of Chulalongkorn University which tried to get some extra rental income for the university. It started with ordinary shops, but has since expanded to a shopping and entertainment mecca that has everything upper-class teenagers and college students could possibly want — luxury shopping malls and glitzy department stores filled with designer labels and hip fashion boutiques. Despite the name, it is not a square in the traditional sense. It could better be described as a warren of small sois filled with hundreds of tiny boutiques, restaurants, cafés, record stores and bookshops, mostly catering to upper-class 20-something Thais, shopping-spree Malaysians, and working ex-pats. If you're not up for a trip to the Gap or a pink martini, it's still worth a visit just to see the Bangkok-of-the-future. The area north of Rama I Road does feature some kind of courtyard on the second floor, which functions as the entry point for the Siam Center, Siam Discovery and Siam Paragon shopping malls. Going east on Rama I Road, the shopping experience continues at Ratchaprasong, an area that received worldwide fame when red shirt-wearing political protesters set up their camp here in May 2010. It is home to CentralWorld, the largest shopping mall in Thailand, which was set on fire during these protests, though it was restored within a few months. It gets more quiet as Rama I Road changes its name into Phloen Chit Road in the east. There are some shops and restaurants here, but the area is mostly home to foreign embassies and airline offices. Siam Square is the most central neighbourhood of Bangkok and can be reached by both the Sukhumvit Line and the Silom Line of the BTS Skytrain system. The easiest entry point is Siam station, right on top of Siam Square and in the middle of the Siam area. It acts as the exchange station between both lines, so expect a lot of commuters during rush hour. The Sukhumvit Line continues east and passes Chit Lom station, which is close to Ratchaprasong, and Phloen Chit which serves the road of the same name. One stop west of Siam on the Silom Line is National Stadium, a handy stop that's close to MBK Center, Jim Thompson's House and the cheap guest houses at Soi Kasemsan 1. The quickest way to get to Siam from Suvarnabhumi Airport is by Airport Rail Link. Take the Express Line to Phaya Thai station, a ride that takes 17 minutes. Then switch onto the BTS Sukhumvit Line and ride it to Siam station. As the systems are not integrated, you will have to buy a new ticket at Phaya Thai station. If you're staying at Khao San Road, the Saen Saep Express Boat is your best bet to get to Siam Square. It is only a short walk to the Golden Mount in Rattanakosin, where you can get on the boat. The service operates every day from 05:30 to 20:30. The Golden Mount Line brings you to Sapan Hua Chang pier for Siam Square, and terminates at Pratunam pier (for Ratchaprasong intersection). You can switch to the NIDA Line at Pratunam pier, which brings you to Chitlom, Wireless and on to Sukhumvit and Ramkhamhaeng. A single trip from Panfa Leelard pier at the Golden Mount to Sapan Hua Chang takes about 25 minutes and costs around 9 baht. Siam Square is among the most congested districts of Bangkok. Combine that with the complexity of the bus system, and it's obvious that you're better off using other ways of transport. However, if you're coming from or going to the Grand Palace area in Rattanakosin, the bus is the only way to get a direct connection. Bus 15 starts at Phra Athit Road and then drives over Ratchadamnoen Klang Road (for Khao San Road), Lan Luang Road, Chakkaphatdi Phong Road and Bamrung Muang Road before arriving at MBK Center, Siam Square and Ratchaprasong intersection. This bus then continues to Silom Road, so take it in the other direction if you're coming from there. An alternative is bus 47, which starts at Rama IV Road in Khlong Toei and then heads to Silom and over Phaya Thai Road. Get off at MBK Center. You can also take this bus from Tha Chang in Rattanakosin (near the Grand Palace) from which it goes through Ratchadamnoen Klang Road (for Khao San Road), Lan Luang Road, Chakkaphatdi Phong Road and Bamrung Muang Road. Get out at MBK Center as this bus won't continue its way further along Siam Square. Bus AE3 from Suvarnabhumi Airport does not run anymore as of June 2011. If you still want to come by bus, you can take bus 552, which goes to BTS station On Nut in Sukhumvit. From there, you can continue your way with the Skytrain. It's a long ride though, and depending on traffic it could take between 1 to 2 hours. It is a bit of a hassle, but if you want to save some bahts, you can claim back the VAT you paid for while buying large purchases. While buying a product, ask the sales assistant to fill in the VAT Refund Form (P.P10) and add the original tax invoice. The total value of the goods claimed for refund must exceed 5,000 baht with each individual product worth at least 2,000 baht. The goods must be taken out of Thailand by plane within 60 days. At the airport, and this is where most visitors go wrong, your goods must be checked at the Customs Office before check-in and passport control. You will get a receipt, which you have to show at the VAT Refund Office after passport control. If the refund amount is lower than 30,000 baht, you'll be paid in cash, otherwise you'll receive the money at your bank account or credit card. For more information, contact the Revenue Department (90 Phahonyothin Soi 7, Phahonyothin, ☎ +66 2 272-9384(-5), ). Siam Square is the place to shop in Bangkok, especially if you're looking for big shopping malls and small designer boutiques. 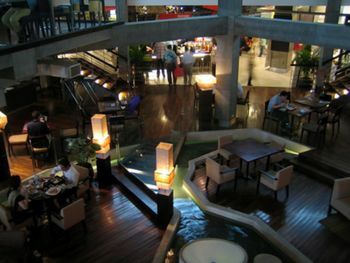 The obvious point of entry is Siam BTS station, which is surrounded by Siam Center, Siam Discovery and Siam Paragon. Technically not a part of the Siam area, but at walking distance, is MBK Center. 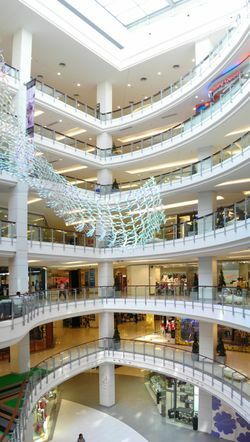 With the exception of Siam Paragon, these malls are somewhat dated, but among the most popular as they are the most affordable. At least make a head for MBK, just to see where the local youth do their shopping. Heading east is Ratchaprasong, an intersection filled with luxurious malls that cater to a more upmarket audience. 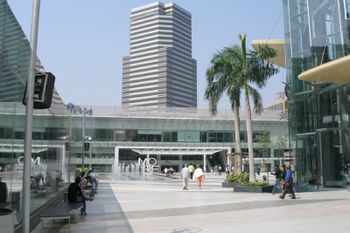 CentralWorld, while built in 2002, was expanded in 2006 topping its nearby rival Siam Paragon as the largest shopping complex in Thailand (and among the largest in the world). Surrounding CentralWorld are the Gaysorn, Isetan, Narai Phand, Peninsula Plaza, ZEN, and others, which together make the largest shopping promenade in Bangkok. Bring a well-filled wallet though. For Thai food with a twist, the hip district of Siam Square is the best place to go hunting. The shopping malls generally have a wide choice of chain stores where you can eat for mid-range prices. If you're on a budget, every mall that takes itself seriously at least has one food court. Soi Ton Son, a side-street off Phloen Chit Road, is known as Bangkok's Little Italy with plenty of nice Italian restaurants. The best are both very good and reasonably priced (at least by Western standards). Branches of Starbucks and the more local Black Canyon Coffee can be found in all the malls and even at the largest BTS stations. Siam Square is not that well-known for its nightlife, as shops tend to close about 22:00 and the area gets pretty silent afterwards. Most visitors head off to Sukhumvit or Silom, but Siam Square does have some relaxing bars on offer. In the winter time (recursively defined in Thailand as "beer garden season"), popular beer gardens pop up in front of CentralWorld, serving up cold beer, hot food and loud Thai pop. Accommodation in almost all price ranges can be found within this area. Hotels in the Hualamphong Train Station area are covered in Yaowarat and Phahurat. 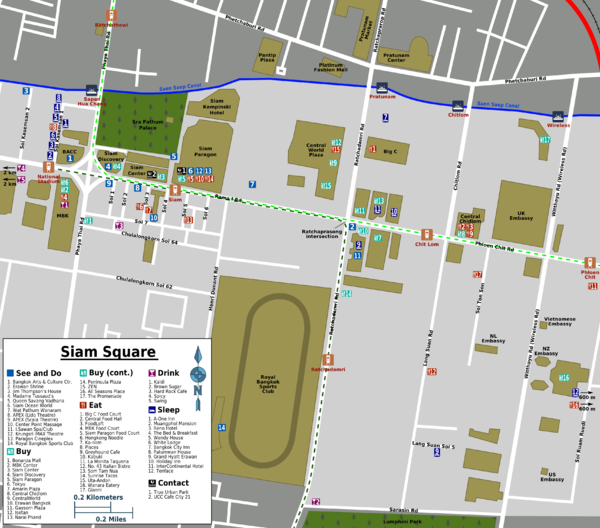 Just at the foot of the National Stadium station, directly across from the stadium itself, is Soi Kasemsan 1, a convenient and quiet lane filled with budget hotels. Most of the guest houses are along the left side of the street as you walk in from Rama I Road. The soi is close to Siam Square, and Jim Thompson's House is only one block away. Pratunam is 600 metres north of Ratchaprasong intersection with plenty of shopping centres, malls and markets. The shopping spree also continues east, when Phloen Chit Road changes its name into Sukhumvit Road. This page was last edited on 12 May 2018, at 15:53.